Blogging daily is beginning to get difficult. I found this little pin while clearing out a drawer. Not everyone keeps 25 year old toothpick dolls wearing out of date fashions. I didn’t make this pin. It was a gift. It is made with just toothpicks, DMC embroidery floss, and a couple of beads for earrings. The hair is stiffened with something like Elmer’s glue, as is the lavender hat. I love the 80s outfits. I remember wearing big sweater dresses with shoulder pads. We wore more dresses then than girls do now. Comfort seems so much more important today than fashion. 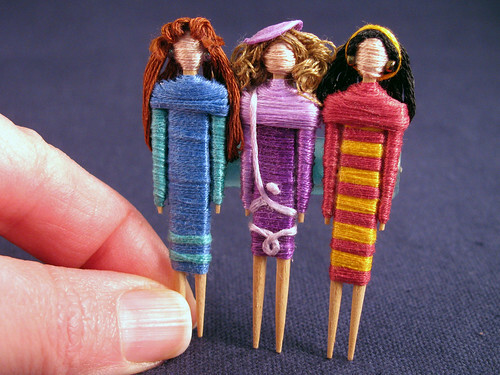 I have been wondering, what style of clothing modern toothpick dolls would wear? This entry was posted on Friday, February 13th, 2009 at 3:00 am and is filed under Craft. Tagged: Clothing, Thread. You can feed this entry. You can leave a response, or trackback from your own site. Those are cute….lots of detail on such a small doll! Today’s dolls? Low rise jeans with a wide belt and a shirt with a bit of belly showing? Is there a pattern for these adorable little dolls. I have a 10 yo granddaughter who would love to make some of these. She is very fashion forward !! !